Not everyone rides the same wave at the same time. Some get on while it’s steep and others prefer to paddle in on the slower side. If you’re not yet on the juicing wave (maybe because you haven’t found a juicer that’s perfect for you, yet), here’s a closer look at another one of our champion juicers. 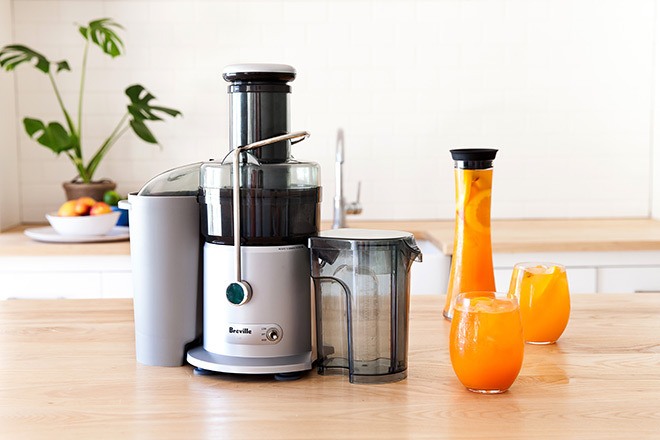 The Breville Juice Fountain was one of the four we put to the test recently in our own kitchen. It comes in at a good price point with some sleek design and juicing skill. Maybe this is the one you’ve been waiting for? The Breville comes with a powerful, centrifugal, 850 watt motor and a 1 litre jug capacity with a foam separator so you’ll be able to produce quick, fresh glasses of health with a clean and smooth finish. 1. Assemble the juicer. The juice jug slots in under the pulp spout so you have to tilt it to fit in under snugly. Then clip on the silver locking handle — you can be quite forceful, it won’t snap off — use the top of the feeding tube for leverage. One good click and you’re ready to juice. 2. Feed your fruit and veg into the tube one by one. The large feeding spout means little chopping or prep work is required. Use the pusher to compress the fruit or veggies down into the centrifugal blades. 3. Continue juicing all your desired ingredients. 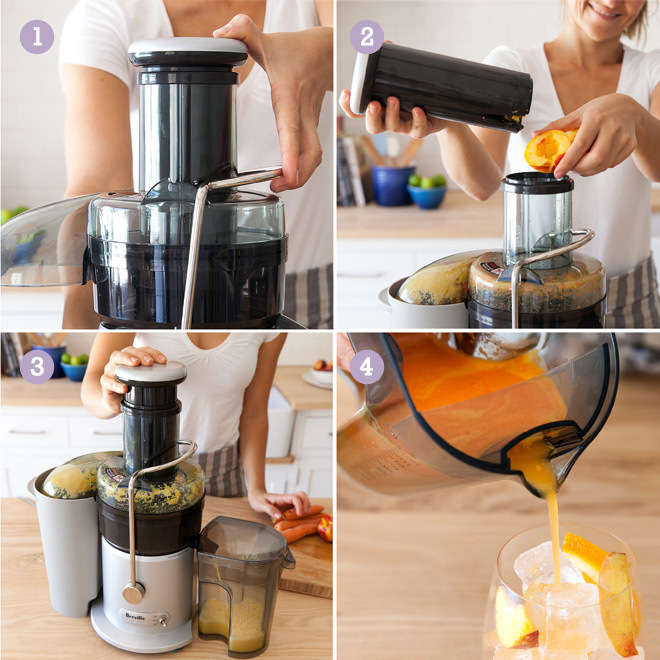 The Breville Juicer automatically separates the pulp into the adjacent grey bin and the juice into the jug. Make sure to use the correct speed depending on soft or hard fruit or veg (faster for hard fruit and slower for softer fruit). 4. When you’re done, switch off the machine and unclip the metal locking handle to release the various compartments for washing. Your juice can now be poured into a glass. The handy foam separating wall and lip will keep back all the froth in the glass while the clear, smooth juice cascades over your ice. If you have a thing for clever tools or top quality appliances check out some more products in our How it works series. Sometimes even seemingly simple things deserve a little more explanation. Seen something interesting but still wondering how it works? Leave us a comment below and we’d be happy to oblige.